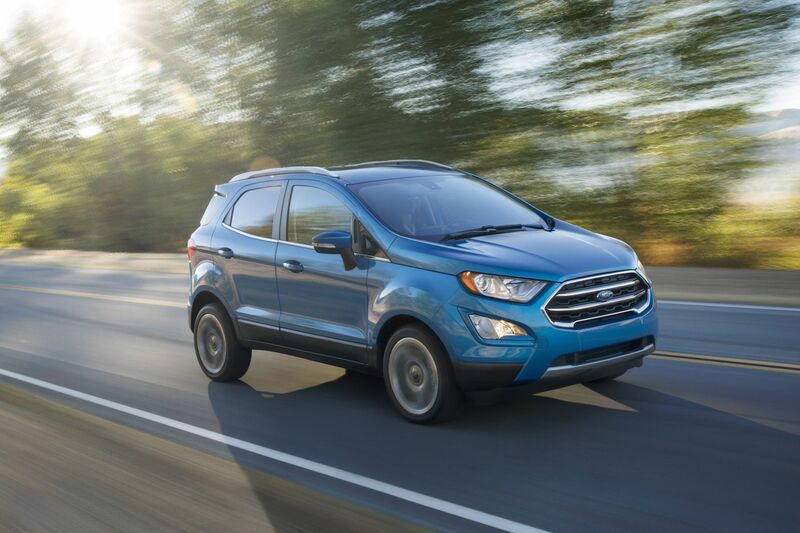 The 2018 Ford EcoSport brings an efficient 1.0-liter three-cylinder to the masses, or all-wheel drive, but not both. And it's kinda homely. Price: $24,720 as tested. Preferred Equipment Group 400A added $395. Marketer's pitch: "Big upgrade in a small package." Conventional wisdom: OK, Ford, why are you spelling it EcoSport but saying it EchoSport? Reality: … and literally nothing else matters. What's new: The Ford EcoSport is Ford's answer to the riddle "Now that Ford says it's going to stop making sedans, what can we expect?" Things like the EcoSport, I imagine. Sadface. Of course, Ford also claims it will make a car without a steering wheel in a couple of years. Ha. Up to speed: The motto here would be "Oy, don't get me started." Literally, because the 1.0-liter three-cylinder engine takes a long time to find motivation — it makes just 123 horsepower. Not surprisingly, I can't find 0-to-60 times for the tiny power plant, and I forgot to sync my calendar app to check it myself. The 2.0-liter four takes just 9.8 seconds, says Car and Driver. Well, hooray for them. We're down here in the cheap seats, pal. On the curves: At first swipe, the EcoSport feels likely to sap any joy from the curves. The steering wheel is loose and turns taken at normal speeds don't project any zip. Surprisingly, though, the EcoSport has a feel resembling the Buick Regal TourX — take turns a little faster than you think you really should, and one might just emit a slight "Whee!" despite oneself. Shifty: The six-speed transmission is no help, but the engine is challenging for any mere mortal gearbox. Shifting is made possible by a button on the side of the shift lever, and it works like a manual, without a lot of overrides, but that's still no fun. Spring for the upgrade in the EcoSport and you’ll enjoy nice accommodations, with a comfortable seat and easy-to-operate stereo. Driver's Seat: I'll pause my rant here to say the upgraded leather seats were quite comfortable. Power controls combined with a crank for lumbar support made all my trips enjoyable from a spinal standpoint. Play some tunes: In the seven years I've been writing Driver's Seat, Ford has consistently had the most musically troubled vehicles. My time in the EcoSport meant system freezes; loss of Sirius XM (it came back, so the subscription wasn't up); and wonky Apple CarPlay maps. The sound is not bad, perhaps a B+, and operation through a pair of dials and just a few buttons was simple. The handsome touchscreen also worked well, so we're headed in the right direction. Friends and stuff: I'm forever putting vehicles to the test with 6-foot-2 Sturgis kid 4.0's extended range legs. This time, though, 5-foot-3 Sturgis Kid 3.0 cried uncle when seated behind the 5-10 Mr. Driver's Seat. Almost zero legroom, and her hair worn in a small bun touched the ceiling. We did manage to make enough room for 4.0 behind the Lovely Mrs. Passenger Seat during one outing, but that entire afternoon I kept wondering why the AC kept shutting down. I realized my sweetie's knee was resting against the HVAC control. Cargo space is 50 cubic feet with the rear seat folded down, which is not bad at all, but further shows just how tall this vehicle is. Loading zone: Sadder than the cramped space is the rear door. For some reason, Ford decided against a typical hatchback, and instead offers a swing-out door with the handle hidden in the right taillight. Mr. Driver's Seat would still be trying to figure that one out but for the glories of smartphones. When parking at Wegmans, don't back in or you may need to pull forward before loading groceries. Outside: My test model came in an attractive Popsicle blue ($340), but a boring silver specimen passed me while traveling in the world, and I realized the EcoSport is a homely little beast. The 17-inch tires look like 15 or less on this tall vehicle; it ends up looking as if it were drawn by the designer that Hyundai fired about five years ago. Fuel economy: I averaged just under 33 mpg in some close-to-home testing while off work. Where it's built: Craiova, Romania. How it's built: Consumer Reports predicts the reliability to be a 3 out of 5. I predict far worse, based on former Soviet countries' track records. In the end: If you need inexpensive space, a Kia Soul would be a far more enjoyable choice, but fuel economy will suffer. Great fuel economy can be had in the Hyundai Ioniq or Kia Niro. So, OK, the EcoSport does offer efficient all-wheel drive (presumably) at bargain prices, but so does a used Sportage.